Self-driving cars have been one of the most transformative technologies in the recent past. Self-driving cars have been one of the most transformative technologies in the recent past. With cars getting integrated with the latest advancements, and innovative feature-led technologies, the future holds various new possibilities, opening up exciting ways to travel and explore, not compromising on the safety of the passenger. Moreover, as vehicles become smarter and more connected, their communication with other vehicles will become more enhanced. This will enable a car to accelerate or decelerate smoothly, which will further help improve fuel efficiency by up to 50 per cent in certain situations. That means lower bills for you, fewer harmful emissions for the environment, and better air quality for all. Tom Von Bonsdorff, Managing Director, Volvo Auto India, believes that the stride towards self-driving cars is well underway, and the destination may be closer than you think. He talks about the future of autonomous cars, and how India should prepare to usher in a new era of road travel, which is safer and convenient. 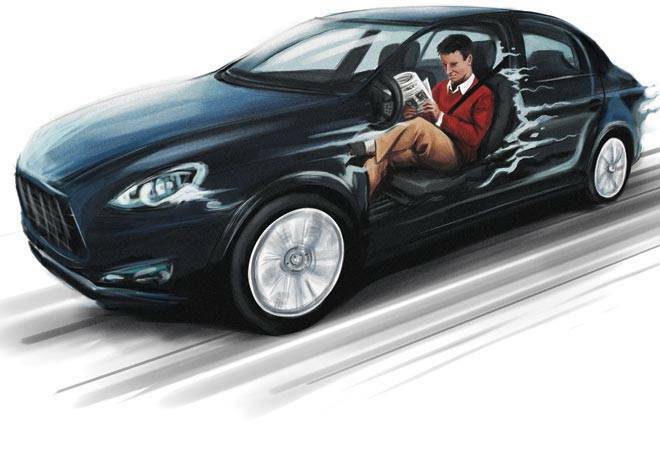 There have been numerous experiments conducted on autonomous cars since the 1920s; however, the first self-driving autonomous car appeared before the public in the 1980s, introduced as a project by Carnegie Mellon University. Since then, car manufacturers and research organisations have been working towards shaping the idea of autonomous vehicles into reality. Cars with basic as well as semi-autonomous capabilities are already in showrooms today, and completely autonomous cars are set to hit the road soon. Volvo has taken the lead by providing a pilot car to Uber. We are in the process of creating a self-driving car that is perfectly in tune with both the customer needs and society needs as a whole. The 'Drive Me' trial starts in 2017 on Swedish roads with real customers behind the wheels of the XC90s equipped with the autonomous drive technology. Our partnership with Uber marks a significant step towards evolving in response to the autonomous drive technologies. In future, cars will be designed to understand exactly where it is and what is ahead, allowing the driver to hand over control of the driving. It will take some time for the technology to become mainstream in India. One important factor is to create and develop laws and traffic regulations on self-driving in the country. Autonomous cars rely on road markings - lane markings, intersection markings, zebra crossings, etc., - and hence these have to be in place for cars to run autonomous. Although India can become a hub for technology development, the current infrastructure of the country is still not equipped to fully adapt to autonomous vehicles. Smart cars do need to be powered with smarter infrastructure around. The government's opening up to radar frequency used in automobiles has accelerated the possibility of autonomous cars in India. This is just a start, and a step-by-step approach needs to be taken for long-term benefit. Keeping safety and environmental concerns in mind, we do need government's support at every stage. Volvo launched its first radar technology-based car, the XC90 T8 Excellence, in India this year. The car is capable of stopping automatically (if the driver does not apply brakes on time) to avert crashes with other cars/ vehicles, pedestrians, cyclists, or large animals. Disrupting the automotive industry Fully autonomous vehicles are unlikely to be commercially available before 2020. Meanwhile, advanced driver-assistance systems (ADAS) will play a crucial role in preparing regulators, consumers, and corporations for the medium-term reality of cars taking over control from drivers. The market introduction of ADAS has shown that the primary challenges impeding faster market penetration are pricing, consumer understanding, and safety/ security issues. Regarding technological readiness, tech players and start-ups will likely also play an important role in the development of autonomous vehicles. Regulation and consumer acceptance may represent additional hurdles for autonomous vehicles. However, once these challenges are addressed, autonomous vehicles will offer tremendous value for consumers (for example, the ability to work while commuting, or the convenience of using social media or watching movies while travelling). A progressive scenario would see fully autonomous cars accounting for up to 15 per cent of passenger vehicles sold worldwide in 2030.